Miguna Miguna has hit back at the Kenyan government over his deportation. File photo. 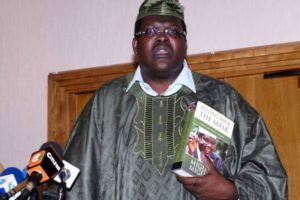 KENYA–Controversial Kenyan lawyer Miguna Miguna has hit back at the Kenyan government over his deportation to Canada that he referred to as a gross violation of his rights. He said the Kenyan constitution is crystal clear and that no one can invalidate or purport to cancel the citizenship of a Kenyan born citizen, adding that Fred Matiang’i has no authority to “take him home” as he shamelessly claimed. Miguna also denied having renounced his Kenyan citizenship, adding that such an act has never crossed his mind. Miguna was arrested at his Runda home in Nairobi, with police using force to break into his house, at 8am last Friday. He was, thereafter, taken to Kiambu police station. The arrest came days after he and Ruaraka MP TJ Kajwang administered an oath to opposition leader Raila Odinga at Uhuru Park. He was the one who stamped the document. Following his arrest, High Court judge James Wakiaga directed that he (Miguna) be released on a Shs50,000 cash bail but Kenya authorities stuck to their guns and refused to release the former Nairobi governor candidate. OnTuesday, January 6, reports emerged that Miguna was to be kicked out of the country through an order by Interior CS Matiang’I and indeed, the plane carrying Miguna surfaced into the JKIA runway ahead of departure a few minutes later. The government today (Wednesday) confirmed kicking Miguna out of the country days after he was arrested over Raila’s oath-taking. First, let me confirm that, yes, the illegitimate, despotic regime of Uhuru Kenyatta and William Ruto forcefully placed me on a late night KLM flight from Nairobi to Amsterdam in flagrant violation of my constitutional rights, five valid court orders and common decency. My purported “deportation” to Canada followed a violent invasion of my home by more than 34 hooded criminals who used detonators to gain access to my residence at or about 5:30AM on February 2nd, 2018; failed to give notice to me of their illegal attendance; failed to identify themselves or the reasons for such violent entry; did not shout “police;” never stated the purpose of their; abducted me; and kept me in unlawful incommunicado detention for five days under the most horrendous, cruel and inhumane conditions imaginable. Second, I wish to express my deep and sincere condolences for the innocent Kenyans who have been brutally murdered by organized criminal enterprise purporting to be the “police.” All the victims of the cascading cruelty and barbarism sponsored by the illegitimate wield era of State power must be condemned in the strongest terms possible as they have no place in a civilized modern democratic, which regrettably Kenya is not, but which is what NRM-Kenya, which I lead stand, aspire and is committed to. Third, let me take this opportunity to thank my wife and family, H.E. President Raila Amolo Odinga, my comrades in the NRM-K, the gallant advocates who have defended me, and all patriots and friends of Kenya who have kept vigil and ensured that the despots eventually produced me in court, even if in contempt of numerous court orders. Fourth, I have never, ever renounced my Kenyan citizenship and will never do that. I’ve never even contemplated it. Fifth, the constitution is crystal clear: no one can invalidate or purport to cancel the citizenship of a Kenyan born citizen. So, Matiang’i has no authority – and I didn’t request him – to “take me home” as he shamelessly claimed. Sixth, even if one had intended to deport me anywhere for whatever reasons, there are well laid legal procedures that must be followed and fundamental rights that must be upheld but which Matiang’i and his illegitimate thugs have violated. Seventh, the illegitimate wielders of power have destroyed and illegally seized my property without any legal excuse or justification. Eighth, three of the goons who kidnapped me and illegally held me incommunicado threatened to kill me. They are Chief Inspector Njoroge, a Mr. Kamau (an immigration officer) and the head of the Flying Squad, Said! And finally, I will challenge all the illegal and unconditional actions by the despots in court starting today. I have instructed a battery of competent advocates to ensure that the ongoing rogue purveyors of impunity are brought to book. They are not above the law, even though they behave as if they are.